Home Costs > How Much Does a Hibachi Grill Cost? How Much Does a Hibachi Grill Cost? A hibachi grill is a Japanese influenced charcoal, gas-powered, or electric-powered grill developed by the western world. These hibachi grills are made in various styles and can be used for indoor and outdoor cooking. Hibachi grills can be very diverse. They can range from the portable hibachi barbeque grill to a large scale electric or gas powered grill. So depending on the size, the costs can vary anywhere from as little as $20 for a portable hibachi grill to as much as $4,000 for a large-scale grill inside of a kitchen. This would not include the installation cost if you were to need it. For a simple household hibachi grill, plan on budgeting $20 to $90. For instance, the popular hibachi grills on Amazon.com retail for $55 to $100. At Walmart, the highest rated hibachi grills designed for home usage retailed for $15 to $39. Some backyard grills were available, with prices ranging from $1,000 to more than $2,200. A commercial grill, on the other hand, can cost $500 to $5,000 depending on the size and condition. On eBay, for example, even though the tables were used, the prices for a commercial Hibachi grill were in the $500 to $1,700 range. A Hibachi grill consists of a grill surface mainly made with stainless steel, aluminum, or cast iron. Some grills may also use charcoal. It has two to six fire powered burners with individual controllers and some may have racks, which are designed to offer versatility when grilling. This will depend on the particular model. It also has the ability to reach higher temperatures within a short time period since it is used to grill and barbeque food. Hibachi grills are mostly built with strong grill plates that help it handle higher temperatures with ease. 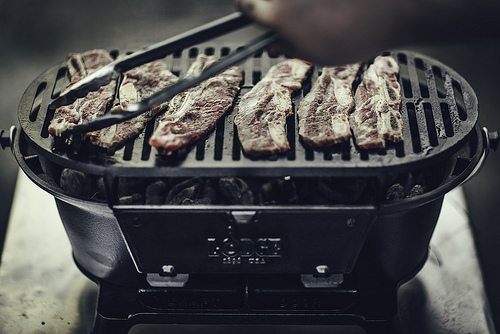 Kebabs and thin strips of meat are perfect for this kind of grill. This grill will either be round, cylindrical or box-shaped and is usually lined with a heatproof material. Larger hibachi grills will have to be installed by a trained professional. If a gas line or outlet has to be installed, the costs can get into the thousands. Since all jobs will be so unique, consider getting free quotes from locally licensed contractors at HomeAdvisor.com. If the grill uses charcoal, this is an additional cost to consider. There are many tools that are needed for grilling, no matter your technique. You can look into purchasing a grill tool set that will include spatulas, metal skewers, tongs or pokers, for instance. Remember to clean the burners at least once a month to produce a better flame. Experts recommend not letting the burners work at higher temperatures constantly. Because a hibachi grill works at such high temperatures, safety should always be a top priority. Always place the grill on a sturdy surface and make sure nothing falls near it. Place your hibachi on top of a broiler pan to prevent burning, cracking or bubbling your counter or table. Your hibachi can also be placed in the sand or on top of three or four flat sandstone rocks. Make sure that the area in which you are cooking is well ventilated. If not, smoke can build up and carbon monoxide can be released and build up. If using a hibachi grill inside, turn on an exhaust fan or point a box fan out a nearby window. Nearby, there should always be a fire extinguisher. A hibachi grill can be used for other things besides cooking, such as different arts and crafts. According to this ehow article, “Use your hibachi as a mini kiln. Make small items such as cups, salt and pepper shakers, and knickknacks. Use coarse clays such as Jiki-tsuchi and Bizen-tsuchi.” Another way the hibachi grill can be used is to forge steel. Do not be cheap with a household hibachi grill. These grills tend to fall apart and rust easier. A good grill should be made of a cast iron. Cheap hibachi grills usually are not worth it.